With the single license it is possible to allocate the license to someone for a short period of time and then stop using it so someone else can then use it. With ConceptDraw products it is possible to reassign a license when someone gets reassigned or leaves the organization. We work with you to preserve your product investment. However, our licensing is not to be switched from user to user so that different people can accomplish work tasks. If you have an interest in switching please let us know. We license ConceptDraw products per named user, making it easy for one to transfer their license from one machine to another. An example of this would be if Will Turner purchased a license of a ConceptDraw product and wanted to transfer it to his new computer, he would just need to log into his account on ConceptDraw.com and then download product to his computer for installation. As long as William is the only user of the product, the license transfer is then successful. You can install your ConceptDraw product both on your Mac and PC. Many users have a Mac and a PC. Most software products penalize you, requiring a separate license for each platform. Not ConceptDraw. ConceptDraw is one of the only programs out there that allows for cross-platform installation with a single license. And the file format is the same for ConceptDraw on Mac and PC, so you can share files freely between platforms. 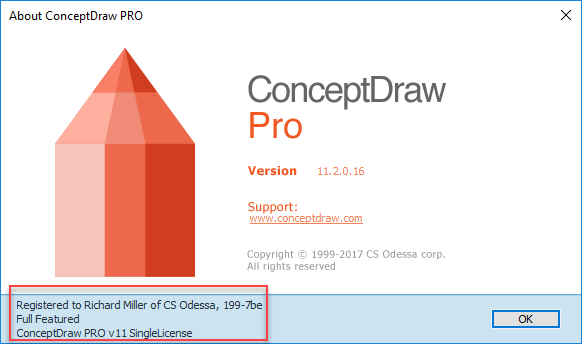 After you have activated your license, just install ConceptDraw on both systems. Then, synchronize with your account, using ConceptDraw STORE Preference settings and your license will be downloaded, automatically activating your product(s). You are eligible to install the ConceptDraw software both on your laptop and desktop computers. and one PC computer, or on a single computer on a cross platform environment. This does not impact current pricing. Read our End-User License Agreement.